Adventure, action, and speed: Sea Life Park dolphins deliver it all!! 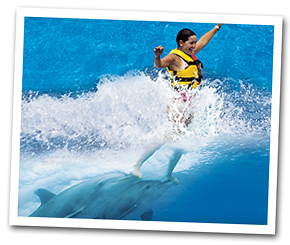 The Dolphin Royal Swim is the most exciting dolphin activity and the highlight of all the interactive dolphin programs. You'll get to know two of their smartest, fastest dolphins and take an exhilarating, thrilling ride that you'll never forget. This is the ultimate adventure for your next trip to Hawaii. Sea Life Park is the perfect place for a memorable dolphin experience on Oahu. This interactive program features two dolphins and can be summarized in two words: exhilarating and thrilling. A kiss on the cheek prepares you for a belly ride and an exciting dorsal fin ride. The most breathtaking moment is during the foot push, when you feel all the strength and energy of these wonderful animals as they push you across the water from the bottom of your feet. This is truly an experience of a lifetime. 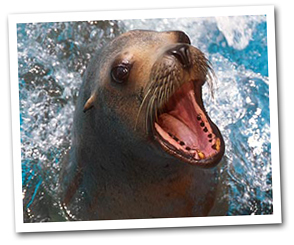 This is Sea Life Park's most popular activity - sign up today and secure a spot during your stay on Oahu. *Schedules are subject to availability. Maximum of 8 guests per tour time.